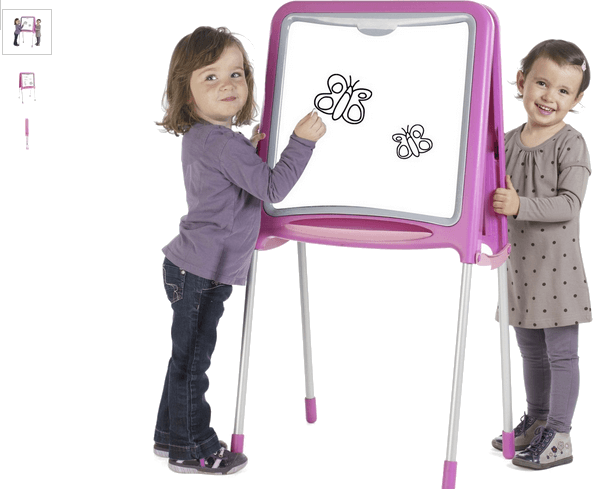 The Smoby Metal Drawing Board (coloured pink) is an exquisite vibrantly coloured trendy double sided drawing board, a perfect addition into your little one's world. Equipped with two (2) pencil storage boxes and two (2) funky paper clicks on top of each side this drawing board is jam packed with goodies. Eighty (80) accessories are included - one (1) erasable felt pen and sponge, six (6) coloured chalks and seventy-two (72) magnetic letters and figures. When your most cherished has finished playtime for the day, the easel easily folds for simple storage. Get money off with April 2019 free Argos voucher codes, see if there's a promo code for the Smoby Metal Drawing Board - Pink product. Argos may be out of stock of this product. To enhance your shopping experience you may also be redirected to a search results page when you click an outbound link. 4.4/5 from 5 recent reviews.